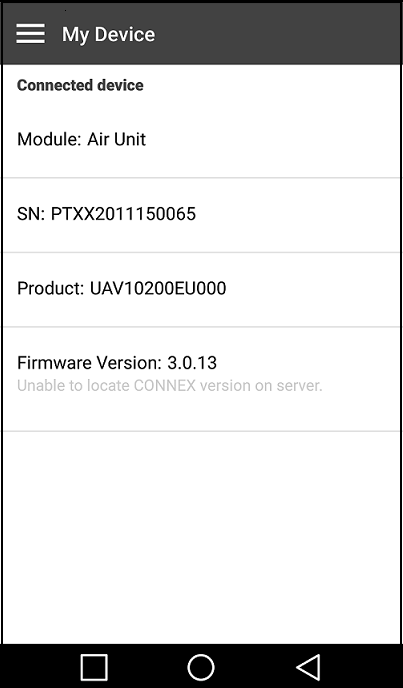 The CONNEX Management application for mobile devices is currently supported on Android devices with operating systems 4.4 and higher. In addition, the mobile device needs to support USB OTG capability. Download the latest version from Google Play to a device connected to an Air Unit or Ground Unit. Run the installation file and follow the displayed instructions to install the application. The My Device screen is displayed. For more information about the My Device screen and the different menu options, refer to Working with the CONNEX Mobile Application.